This is the Artec Vintage Tube Booster Unit. The "VTB2" is a scaled-down version of the VTC Unit, but unlike the VTB1, the VTB2 features 2 Gain Stages. When in the off positions, the unit is in a True Bypass. When you flip the 1st switch, an overdriven boost of gain is engage, flip the 2nd Switch for High Gain Mode. 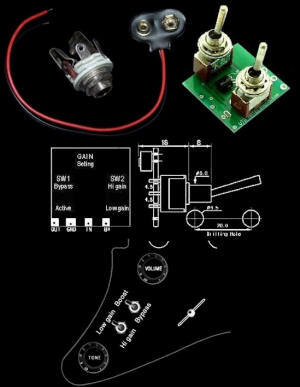 Easy installation with any Passive or Active pickups in your Guitar or Bass (you will need to dril l small holes for the switches to mount into your body or pickguard). Powered by a 9v battery (1 battery will last more than 4000 hours!!!). You will receive the Unit itself, as it is pictured, with a Battery Clip, & Stereo Input Jack (incase the one you have on your guitar is Mono), as well as a wiring installation wiring diagram (very easy to follow).